Food is one of the main things that excites me about travelling and it never disappoints, the different tastes, the unique texture and the savoury bites of the delicious foods would always make you wanting for more. When travelling around Europe you are greeted by the sheer amount of specialities and delicacies that make you question how these fascinating recipes came to be. The history behind the many dishes stems from the roots of the previous generations; the techniques are passed down to preserve the traditions and original flavours of every dish that they make. I would like to share with you my experience of my time in Europe where I was captivated by the sights and flavours of the specialities of each individual country. Although I tried many different types of speciality foods including the signature dishes of the country, I felt that I had just barely scratched the surface of what there was to offer and if I had delved deeper in to the bottomless pit of food; I would have not be willing to return. In the following months I will be writing about the different places in Europe that I explored providing you with an insight on what travelling could offer with my journey. It will open your eyes to the new cultures and diversity that shows that although they are all connected by land the differences between can be worlds apart. My first destination was Munich, an easy two hour flight (return) away from London Heathrow at an average cost of around £100 depending on how advanced you book the flights. The availability is plentiful as there at least four flights going daily with the German airline Lufthansa. The flight is usual by the normal standards and since it is a short flight there is no entertainment system on board or food. However they do provide you with a fully filled advertised magazine that makes you wanting to spend more money before even reaching your destination. Munich is very famous for its meats especially the endless variations and supply of sausages. They are very fond of veal as well which I saw practically in every menu that I got my hands on. My first stop was obviously the local market in the centre of the city; it was an unbelievable sight that opened my horizons vastly about Munich. I was very lucky as I had gone during a festive time where many of the locals were preparing for Oktoberfest, many of the locals was dressed up in the traditional Bavarian costume. Now when we’re talking about sausages in the UK it’s most likely the standard Cumberland, Lincolnshire, Premium Pork or maybe even the Apple Pork ones. Then you get the posher variations with the different flavours such as caramelized red onion, Sicilian style, black pepper etc. However when talking about sausages in Munich, this becomes an entirely different league on its own. At first entering the market you would be bombarded by the different signs and smells of cooking meat. I remember when walking into this local shop I probably walked past at least ten different types of sausages just hanging from the ceiling, there was more packed at the front to showcase to the customers. They would grill the sausages in front of you inviting you with its sensational smell and I even saw several types being boiled, this ended up being my favourite type of sausage that they offered. The first type of sausage that I am going to describe is the KNACKWURST; this was one of the most popular sausages that I found on the market and surprisingly it stood up to its popularity. It is made filled with pork and finely crushed garlic however the main feature was the skin of this sausage, every bite was satisfying to the ears and mouth as you would take crunch which provides this unique texture which enhances the flavours of the pork. The second type is called WEISSWURST, this was something that completely threw me off as it looked different to your everyday sausage, it had the shape but the colours and texture was another entity. It was white in colour with speckles of herbs all around and broke apart very easily; the weisswurst is made mainly from veal with pork and spices. It was very easy to eat and the flavour was astonishing, although a bit milder in the seasoning you could taste the richness of the veal. This type of sausage was boiled which allowed the sausage to retain most of its juices and flavour. 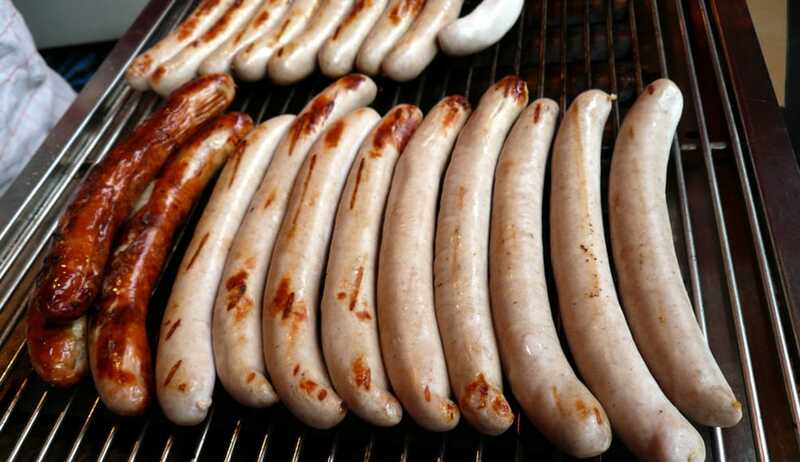 There were many other different types of sausages such as bockwurst, landjager, wollwurst, blut sausage, frankfurter that was available and each and every one of these had its own unique characteristics. Walking along the market and shops there was another view that I couldn’t keep my eyes off and these were the pretzel shops. 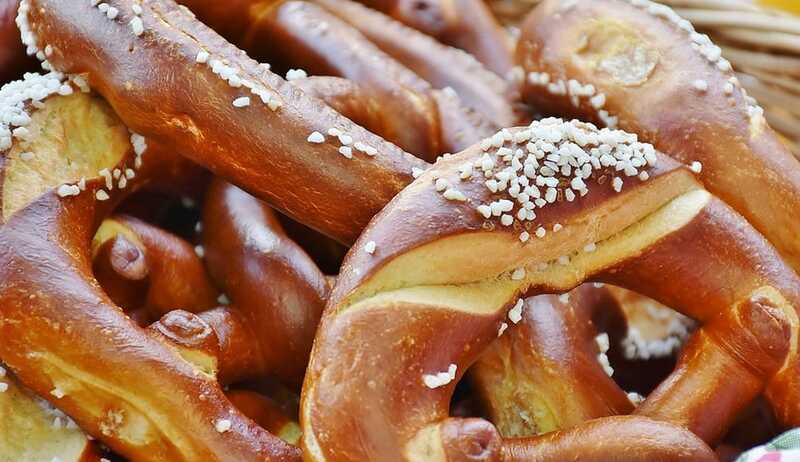 Pretzel’s history goes far back to even the early middle ages and if you went to Munich and didn’t have a pretzel that would be the same as having a cheeseburger without the cheese. The amount of diverse shapes and sizes that these bakers could produce with the pretzels was outstanding. You could see the humungous cross patterned pretzels in funky symmetrical a ribbon out on display proudly facing all the people passing by. I knew I had to try one after seeing these and I found the bakeshop which was filled with the best baker’s aroma. The pretzels were salty and had a crunchy texture, it was glossed on the outside making it very appealing to hold and munch. There were various types of pretzels which showcased individual textures, some were soft in the middle and others just like light toast. There were sweet and salty flavours depending on the seasons which represent even more of its tradition and background. After the food we ended up in a beerhall and this took my drinking a pint to shame, the glasses they used for the beers were at least two pint sizes and you would just see all the locals gulping down the beer as if it was them drinking water. The atmosphere was like no other as everyone sat on these long wooden benches with long tables making you feel slightly like those medieval inns that you saw on TV. The friendly staff and the enchanting laugher of all the customers in the hall show a wondrous side of Munich that you wouldn’t normally see walking down the streets. I have described to you only a glimpse of what Munich has to truly offer and the little activities I partook; there is so much to talk about however I am not able to fit it all in. I would definitely recommend a visit to Munich if you have a chance as I believe that it would provide you with an unforgettable experience. This blog post was written by Travelpharm pharmacist Tom Iun, and reflects his personal experiences when travelling in Europe.